It is interesting that the vital details of Bertha’s life were documented in the church records of both Zion Lutheran Chattanooga and Zion Lutheran Schumm. According to the birth/baptism records of Zion Chatt, Bertha Margaretha Allmandinger was born 9 November 1903 to Wilhelm and Barbara (Hoehamer) Allmandinger. She was baptized 29 November 1903 and her parents were her sponsors. The Allmandinger family moved from Mercer County to Van Wert County about a year after Bertha’s birth in 1903. In 1904 Bertha’s younger brother Hugo was baptized at Zion Schumm. Bertha was confirmed at Zion Schumm on Palm Sunday, 1 April 1917. According to her burial record at Zion Schumm, Bertha Margaret Allmandinger, was born 9 November 1903 in Black Creek Township, Mercer County, Ohio, to William C. and Barbara S. Allmandinger. 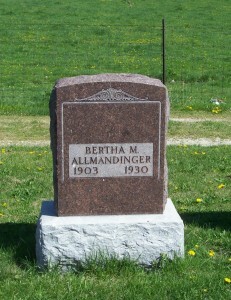 Bertha died 6 November 1930 at the State Hospital in Gallipolis, at the age of 26 years, 11 months and 25 days. She was buried 10 November 1930 at Zion Cemetery, Schumm. 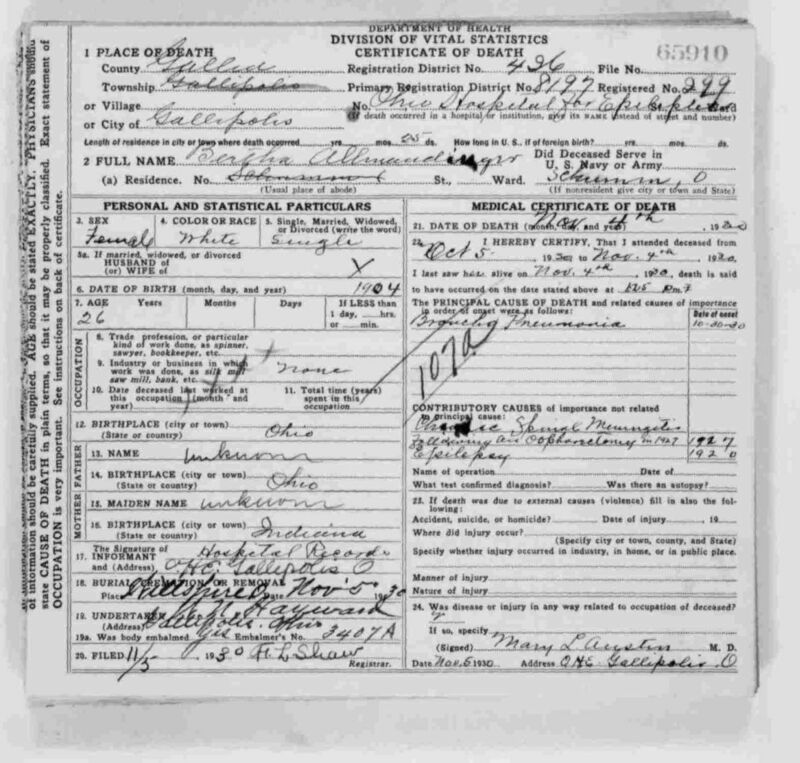 Bertha Allmandinger Ohio death certificate, 1930. 1900 U.S. census, Black Creek, Mercer, Ohio, ED 74, p. 10A, dwelling 200, family 200, line 5, William C. Almandinger; digital image by subscription, Ancestry.com (http://www.ancestry.com : accessed 9 June 2013); from FHL microfilm 1241303, citing National Archives microfilm T623, roll 1303. 1910 U.S. census, Willshire, Van Wert, Ohio, ED 114, p. 4B, dwelling 79, family 80, line 60, Wm. Allmandinger;. digital image by subscription, Ancestry.com (http://www.ancestry.com : accessed 9 June 2013); from FHL microfilm 1375251, citing National Archives microfilm T624, roll 1238. 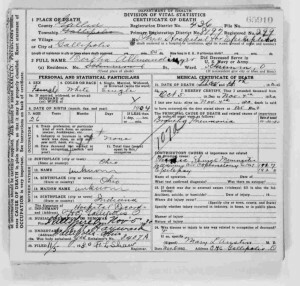 “Ohio, Deaths, 1908-1953,” index and images, FamilySearch (https://familysearch.org/pal:MM9.1.1/X8TL-K87 : accessed 0 June 2013), Bertha Allmandinger, 4 November 1930. “Gallipolis Epileptic Hospital,” Asylum Projects, (http://www.asylumprojects.org/index.php?title=Gallipolis_Epileptic_Hospital : accessed 9 June 2013). It’s a shame that the mentality of that time was to sterlize women so they couldn’t have children if they were epileptic. They apparently didn’t have medicine to control seizures then. I’m sure you are correct. Medical treatment has come a long way and epilepsy is controllable today. OK, now you have opened a hornets nest. Since I have both Hoehammer and Almandinger cousins, I am left wondering if these are relatives or just coincidental families with the same name. There is never enough time to sift out all the answers. Looking forward to your usual “rest of the story” next Tuesday to see if I can get any more clues. Indeed! I see that you do! And I’ll see if I can show the connection soon. These church records are full of interesting information and family connections. And how interesting that these families are contained in the records of both churches.